Due to unforeseen problems at the pressing plant, the Corpus In Extremis vinyl has been delayed for several weeks. We recently learned about it so that’s why no updates have been posted about it. All orders that have been sent to Listenable will be sent out as soon as they can, the records arrived at their office at some point last week.Thanks for your patience and we’re very sorry for any misunderstandings or confusion about this matter. 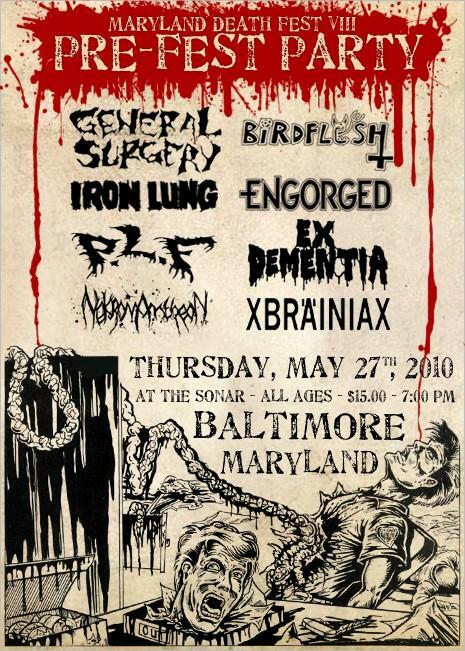 We just got confirmed that we’ll be appearing on next years pre-fest extravaganza, held the evening before the Maryland Deathfest starts. The show will be on the indoor stage in the main room on Thursday 27th of May. As per usual, we’ll see ya’ll in the bar afterwards! Stay tuned for some more exciting 2010 shows getting announced pretty soon.